A very special, pure, zero voc wood finish. A zero Voc, all natural wood finish. Looks and Feels Great! 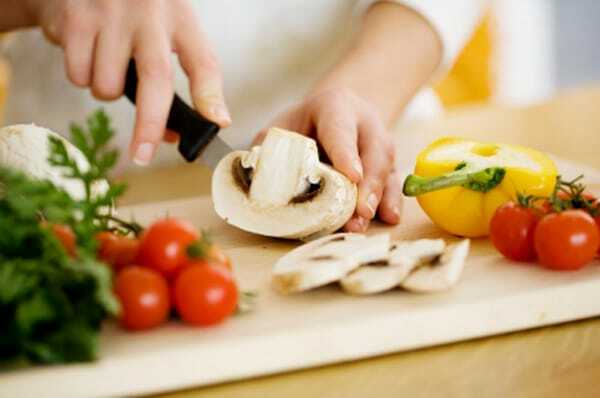 ​Non toxic, Food Surface Safe. Saturates raw wood with dense beeswax and a super pure oil made from the flax plant. Silky Matte Finish, Beeswax and Plant Oils, Georgeous! It goes far and is very easy to apply with a rag! Use this beeswax polish on it's own, directly over wood, or as a perfect accompaniment to polish Bio Poly Natural or Rainforest Sealer. Fine woodworkers have raved throughout history that the best looking wood finish combination is Beeswax and Linseed Oil. Use Looking Glass by itself for most surfaces. ​For high traffic surfaces apply Bio Poly Natural and then buff in a topcoat of Looking Glass. This creates a very rich, buttery smooth, long lasting wood finish. A joy to work with and fantastic looking. Use it for cutting boards, cribs, floors, trim, furniture and all the wood in your life. We do, and Yes, our kids play safely in those spaces! Meets the requirements listed 21CFR175.300(1) for coatings that may be safely used as the food-contact surface. ​Linseed Oil and Beeswax are Substances Generally Recognized as Safe (GRAS). Of course, we don't make our products as food but we do feel that is an ideal, a safer route to go when it really matters. Two purified ingredients. Both are FDA GRAS. Looking Glass was originally invented for cutting boards when the founder's infant son was born. Wondering. What about Cribs? Floors? Cutting Boards? A bit of neurosis, love and necessity spurred the invention of one of our favorite wood finishes ever! Giving a quick "spruce up" to the family table before the holidays. Oh...and that's the spry baby boy it was invented for back in 2006! Nearly all ingredients in Earthpaint Inc. finishes can be gathered locally within one days drive of Asheville, NC, where Looking Glass Polish is made. Wood that is cared for with Looking Glass Beeswax Polish will never need to be stripped. There will never be any cracking or peeling film to sand down. Wood will be breathable and nourished. If ever a freshening up is needed it’s as simple as just taking out the little can of Looking Glass and wiping on another coat. Beautiful, Strong, Sustainable. Floors with Bio Poly NT or Rainforest can be maintained with Looking Glass by simply wiping it on and buffing it off. Use on clean raw wood or over Bio Poly NT or Rainforest Sealer. Buff on and off like waxing a car. Wipe on with a rag. For larger floor finishing projects use a Floor Machine. A Plea for the Bee! This Bee visited us on the very first Looking Glass Beeswax Polish Job! 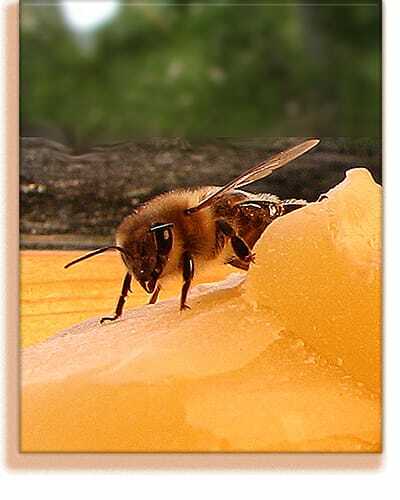 Colony Collapse Disorder was responsible for a sudden drop in honey bee population. There are synthetic and plant waxes we can use instead of beeswax. These are actually less expensive. However, after many years of investigation we found that it is essential to support Bees financially. By not buying beeswax we removed funds from Apiaries that need them to help bees grow healthier. Surely, there is a vegan argument to make for bees, unfortunately, the natural state of bees has been seriously harmed by humans. Research is being done to discover more about bees. This MIT Synthetic Apiary Environment is learning a great deal about how to keep bees on planet Earth for the long haul. The Yellow Faced Bee is now on the Endangered Species List. This cannot continue. We need to do all we can to protect all our friends on Earth but the human species relies a great deal on the bees for our food souce. It is of great concern that Bayer has merged with Monsanto. The company poisoning bees is joined with the company poisoning food! Opposing these seflish capitalistic practices is part of protecting bees. We certainly cannot rely solely on our Government to regulate this since that is partly why bees are in trouble now. ​The only wood finish we use on our own cribs is Looking Glass Polish. It's worked fantastically over the years. Wipe on. Wipe off with a dry cloth. Easy. Works Great on Cabinets. 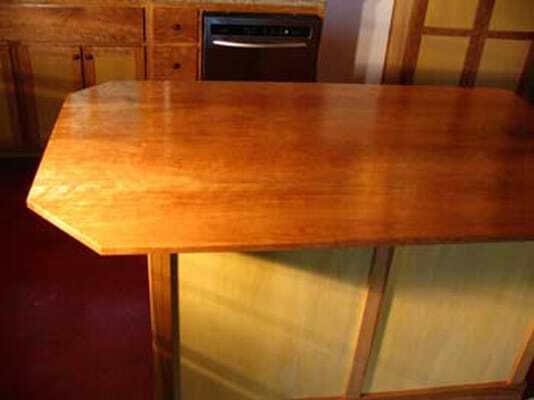 These Cherry Cabinets were rubbed with Bio Poly NT and then Looking Glass Beeswax Polish. They've stood the test of time. Perfect for Bedroom floors. Feels fantastic on the feet. Use a Floor Machine or Buff by hand.